The Atlantic: Why are American Drinkers Turning Against Beer? The Atlantic posted an interesting article today questioning the decline of beer. The primary source for this data is from a Gallup poll that has measured for the past two decades the drinking preferences of consumers. 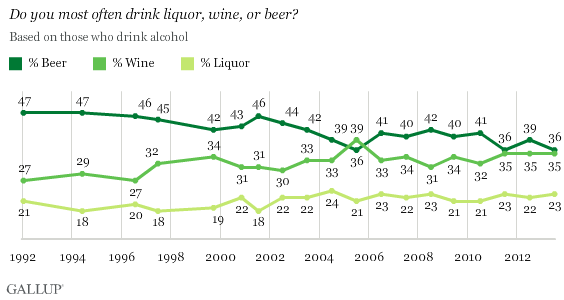 The below graph is one of several in the article showing that wine and liquor are making gains towards beer as the preferred alcoholic drink of choice. But craft beer brewers operate in their own micro climate. In 2011, production jumped 13% to 11,468,152 barrels, for a 5.7% share of the US beer market in volume… it’s been an awesome year for craft brewers. What it shows is just how successful American entrepreneurs can be with their scrappy outfits in an industry of giants. 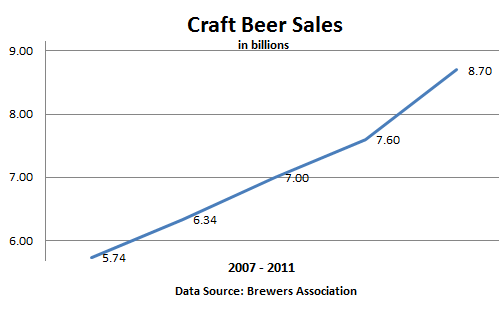 To make sense of this, you have to remember that craft beer makes up ~6% of the entire beer market. The other ~94% belongs to the light American lager brewers. 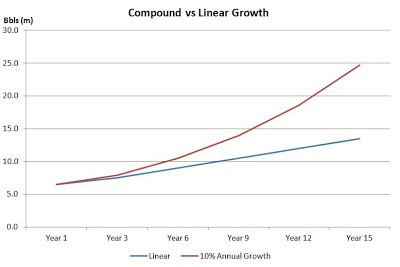 Currently, for the first half of 2013, the Brewer’s Association reports sales increases of 15%. Conversely, both Anheuser-Busch and MillerCoors reported sales losses of 2.8% and 4.4% respectively. These two companies alone pretty much make up that ~94%. When they both see declines in sales, it makes a huge impact on the overall sales of the entire industry. The Atlantic does a good job realizing that consumers today have different preferences and priorities with alcohol than they did twenty years ago. However they miss a great opportunity to see how those preferences are changing, especially within the beer segment. The rise in demand for craft beer, wine, and spirits is a strong indication that there is a stronger preference in America for higher end alcohol as opposed to less flavorful, mass produced beers. All in all, I think that it’s fair to say that those within the craft beer industry are doing a hell of a job, and in case it isn’t obvious, there is definitely a need for continued growth!